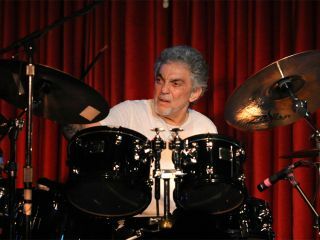 Is Steve Gadd the most influential drummer of all time? Could be. Along with Ringo Starr (with whom he's played alongside and counts as a friend), he's one of the few sticksman whose licks and patterns have been scrutinized, emulated and downright ripped-off by millions of drummers across the globe. And with a resume that boasts sessions and tours with the likes of Chick Corea to Eric Clapton to Steely Dan to Paul McCartney to James Taylor to Paul Simon to you-name them, he's put his indelible stamp on rock, jazz, blues, fusion and pop. If there's a form of music he hasn't played, chances are it hasn't yet been invented. "Every drummer wants to play like Gadd because he plays perfect," Chick Corea once said. "He has brought orchestral and compositional thinking to the drum kit while at the same time having a great imagination and a great ability to swing." Gadd, however, sums it up thusly: "The word 'perfect'...I don't know anybody who's perfect. You go out there and do your best. And if you don't nail it, then you go out the next day and you try to get it right. That's really all you can do." From the mid-'80s till the early '90s, Gadd led The Gadd Gang (which featured, in addition to Steve, guitarist Cornell Dupree, bassist Eddie Gomez, keyboardist Richard Tee and saxophonist Ronnie Cuber). The quintet tore it up on a number of critically acclaimed recordings. And now Gadd is back with a new band, the aptly named Steve Gadd And Friends, which sees him reunited with Cuber and working with new recruits, Paul Bollenbeck on guitar and Joey DeFrancesco on organ and trumpet. Late last year they recorded a live set at Voce's Lounge in Scottsdale, Arizona, which has now been released as the CD Live At Voce. It's amazing how you guys sound like a band that has played together for years. Now, I know you've worked with Ronnie before, but Joey and Paul are fairly few to you, right? "Well, yes and no. I met Joey when he signed his first record deal with Columbia. Over the years we had talked about playing together, but we never really did until recently. Our inspirations are the same, and we listen to the same kind of music." "I listen to a lot of Miles Davis. Then there's people like Art Blakey and Max Roach…all incredible musicians, of course. Joey grew up on the same sort of stuff. As far as organ players, he loves Jimmy Smith and Groove Holmes. I think he used to sit in with a lot of those guys when he was a kid. He comes from a musical family who were very supportive of what he wanted to do - similar to my upbringing - so we have a lot in common." The musical telepathy between you and the other players really comes across on the new record. With a band like this, do you see yourself as the 'glue' - you know, the guy who holds it all together and lets everybody else shine - or are you the leader? "It's my band, so I call the shots and come up with the setlists. As a leader, though, I do try to operate as the glue and allow everybody to do what they do best. That's what a leader should do, really." One thing that really struck me on the record is your brush technique - all the different nuances you throw in. Do you feel that brush playing is becoming a bit of a lost art, particularly with younger drummers? "That's a hard one. There's a lot of music that doesn't lend itself to brushes, but whenever I find a song that calls for them, I with them without hesitation. With this group, I'm in a situation where I can play with brushes quite a bit. I love 'em; there's so many things you can do with them. I think if a lot of younger players did have the opportunity to play with brushes more, they'd fall in love with them, too. But so much of the music that's written today is pretty much all stick-driven. That's just the way it is, I guess." I love the band's interpretation of Them Changes, which is probably the most 'rock' track on the album. On the other hand, there's Georgia On My Mind, which has a groove that's so relaxed and gentle. In fact, it's almost nothing but groove - two minutes go by before the traditional melody is established. "Yeah, I really respect the musicality that the group brings to a piece of music that people know so well. They wanted to arrange the song in that way, and I think it worked. The truth is, every time we play it, it's never the same. Georgia On My Mind is one of those songs you can do that with - it's so malleable. What's important is to capture its emotion. No matter how you stretch it, you've got to get the feeling right." Your playing on that song is notable for what you don't do, which is to go off and be flashy. Do you feel pressure sometimes to perform, to always be demonstrating your chops? "I think when I was younger I experienced those feelings more, and I'd give in to them. Through the years, I worked on that; I developed discipline. Instead of driving the music with this need to show off, I've learned to let the music dictate what I need to do. You have to really listen in order to do that." You've done so many high-profile gigs. Playing with this group of musicians, is it a chance for you to recharge your batteries in a low-key, no-pressure kind of way? "Hmmm. I don't know if I have to recharge my batteries. This is just more of an opportunity for me to have a little more say in what's going on. The way this whole group came about is because I found myself with some extra time on my hands, some work fell through, and these are guys that I love so it all came together. We got together and played, and it was a lot of fun. The music sort of evolved, and it continues to." What are your plans for the band? Are you planning on doing some more gigs, or maybe an actual tour? "We'll have to see. It depends on everybody's schedule. I'd like to play as much as we can." As I'm sure you're aware, your drumming style and patterns have been studied extensively. What do you tell players who want to emulate you? Do you feel as though people want to copy you to the point of obsession? "It's good to be inspired by other drummers; not because you want to sound just like them, but you can take different things from them and create your own style. I'm very flattered that people like what I do, but at the same time, I would tell them to take what they like about it and turn it into their own thing." "You can't be a copy of somebody else, no matter how hard you try. It's impossible. I've seen people try to copy licks and get them exact, and I can tell they're not playing in a way that's natural or comfortable. That's not what music is all about. You have to develop your own bag of tricks. The worst thing in the world you can do is let your enthusiasm for somebody else's work stifle your own creativity"
Let's talk about the whole concept of being 'in the pocket' of a song. Whenever drummers talk about your playing, they say the same thing: "Nobody gets in the pocket like Steve Gadd." "Yeah, well, you have to pay attention to dynamics - of the song, of the other players and so on. You can't just think about what you're doing. I've seen so many drummers who have chops and technique that would make your jaw drop to the floor. People are doing some really incredible things. To me, though, I find it just as inspiring on a whole different level when I see somebody who can play a groove and get inside it and make me tap my toes. If you can get people tapping their toes, that's it - you're playing music. Then you can throw in some technical stuff if you want." You switch between grips a fair amount. Sometimes you use a matched grip; other times you use a traditional grip. Any particular reason? "Comfort, really. If I'm playing a real heavy backbeat, I find I can sit straighter and hit harder when using a matched grip. If I have to do more technical things, I'm more apt to use a traditional grip. I don't really think about it; it just the way I play." "If you can get people tapping their toes, that's it - you're playing music. Then you can throw in some technical stuff if you want." A lot of great jazz drummers can't play rock, and a lot of accomplished rock drummers have no feel for jazz. Yet there doesn't seem to be a genre you haven't mastered. Rock, pop, jazz, fusion, blues - you're right at home no matter what. "I think the big thing is, I'm always trying to challenge myself. Always knowing that there's something new to learn and a new way of playing in a particular genre or with a certain artist, that's the deal, that's my job. If I'm helping to keep an artist inspired and be comfortable, then I'm going to feel good and we're going to create something together - hopefully." By a lot of drummers' standards, your setup is quite minimal. Do you find big kits unnecessary? "When I play with Eric Clapton or Paul Simon or James Taylor, I find that a kit with four toms works out just fine. Any fills that I want to play or sounds I want to produce, I can get them on a set like that. I even wish I could go in with less, but the size of the bandstand and the venue come into play. Really, the amount of drums you have isn't as important as the band playing well together and getting into a good groove." What would be considered your normal practice routine. Do you have one? "Not really. I'm on the road so much, and I work a lot, so I don't need to practice when I'm touring. The only times I'll practice are when I'm off the road. Not right away, though - I like to settle down and spend time with my family. Then, after a few weeks, I'll start missing the drums, so I'll go out the garage and work on rudiments and stuff. It becomes a meditative thing: I loosen up, unwind, get in the right mindset. One thing I try to do is not work on too many things at once. I like to take one thing and focus on that. Again, it's a form of meditation." "Here's a good exercise I like a lot: I take one idea and use it as many different ways as I can. I'll take four beats and divide them up between my right foot, left foot and both hands - the combinations are endless. If I stumble upon something and I like the way it sounds, I'll work on it and make it comfortable. Then I'll figure out how to do the same thing but start it at different parts of the bar - it's the same pattern, but I'm playing it at a different point, so it's going to sound different. I like ideas. Working on musical ideas and not just technical things is what I'm all about." Speaking of musical ideas, one of your most famous drum intros is from Paul Simon's 50 Ways To Leave Your Lover. How did that pattern originate? Did Paul have a firm idea of what he wanted, or did you come up with it? "It was pretty collaborative. We were working on the song in the studio, and I remember the bridge was feeling OK, but the beginning wasn't sounding as good as it should. It was fine, but it wasn't all there. What I used to do was practice between takes, and one of the things I was working on was using the left hand on the hi-hat and creating different combinations between the hi-hat, snare and bass drum. "Phil Ramone, the engineer, and Paul heard what I was doing and it was suggested that I come up with something like that for the intro. It was as simple as that. I tend to look at situations like that as almost group efforts - everybody contributes." Given the circumstances at how it came about, are you amazed at what an iconic pattern it's become? Drummers everywhere refer to the '50 Ways' intro as one of the best of its kind, a pattern they just have to learn. "I'm grateful, of course. Amazed? I don't know if I'm amazed…Actually, yeah, I am amazed. You know, I just went in as a sideman and came out with this piece of music that everybody talks about. You never think that's going to happen. When you go in to do a session, you just want to make the songs work for the artist. You don't think about anything other than that." Talk to me about your association with Eric Clapton. What kind of dynamic do the two of you have? Does he give you a lot of direction? "He lets everybody pretty much do what they do. I think the times when he gives direction are those situations when he's not as comfortable as he could be. A lot of the songs that we play have been recorded before with various bands and musicians over the years. Or they could be his interpretations of old blues songs - the stuff he grew up on and respects a great deal. Sometimes I'll try to duplicate what was done before; other times I'll throw a couple of little changes in there, but nothing too drastic. I'm not there to rearrange what Eric is all about." "But back to the question of direction…He never gets into real specifics. Eric is a feel player. Nothing is ever written in stone with him. He'll talk about the feel he's looking for, but he doesn't get too technical. With him and a lot of guys I play with, it's all about sharing what's on the bandstand. You go up and you put your heads together and hope that it all works out." "The fun thing about playing with Eric - and I could say this about a lot of people - is that every night is different. A lot of nights are pure magic; others aren't. The trick is not to set the bar so impossibly high every time you play, because there's too many variables that can affect a performance: the energy of the audience, the energy of the band, the sound, all the kind of stuff. What I've learned over the years is to appreciate the nights that are magic, and on those nights that aren't magic, hey, you still give everything you've got. You always try, though." Your discography is so vast, there's no way to list even half of the artists you've worked with. However, I do want to ask you about playing with Paul McCartney, who's no slouch on the drums himself. "In one way or another, the job is always the same: you try to come up with parts that are supportive of the music. When I worked with Paul, he didn't give me a lot of direction per se. There were a few times, I think, when I wasn't playing as big and loud or as energetic as he wanted, so I made whatever adjustments were necessary. "Again, I try to listen to the song. If you can listen to the song and really visualize in your head what it needs to be, you can figure out the dynamics and the backbeat and everything else. "I remember there was a lot of emotion in the air the first time I recorded with Paul. It was not too long after John Lennon had been shot, so as you can imagine, things were…it was heavy. The emotions that everybody was feeling, coupled with the beauty of our surroundings [the island of Montserrat, where George Martin operated AIR Studios], it all came out in the music. Oh, and Ringo Starr was there, too. I had played with him on one of his solo records, so we were old friends. It was great being around him; he's so inspiring." "There was a lot of emotion in the air the first time I recorded with Paul [McCartney]. It was not too long after John Lennon had been shot, so as you can imagine, things were…it was heavy." "Yeah, I know what you mean. We had a great time together. See, Ringo comes from a different kind of school, and I find that totally exciting and challenging. How he does what he does…it's so different from what other drummers do. If somebody approaches music or their instrument in a way that's unique, I want to be around that person. To me, there's something to learn there." So many drummers the world over put you at the top of their Best Drummer Ever list. I'm curious, who's on your list? What drummers float your boat? "Well, first of all, I learn from everybody. Whatever it is I'm listening to, I take something from it. Growing up, I had a lot more opportunities to listen, so I've got my guys who were my favorites and who will always be my favorites. Gene Krupa and Buddy Rich, Louis Bellson, Philly Joe Jones, Art Blakey, Elvin Jones, Tony Williams, Jimmy Cobb, Papa Jo Jones - they were all unbelievable. "And then there are people who are now my co-workers, but I don't get many chances to listen to them because we're all working. There's so many drummers who blow me away. Drumming has come so far and the techniques people have developed are unbelievable. I'm always flattered when somebody says they like what I do, but really, I'm just continuing a thread that was started a long time ago."